Lawhill under sail, her destination – Biera in the then Portuguese East Africa. On this occasion, Passat arrived from Port Swettenham in Malaysia on 2 March. As she made the voyage in ballast her royal yards had been taken down to improve stability but were replaced prior to her voyage to Falmouth UK. One could imagine that the boat-load of her crew is heading ashore to the Wauraltee Pub, a favourite gathering place for not only the grain ship crews but most of Port Victoria’s residents as it is the only pub in town. Passat made one more voyage out of Port Victoria in 1949. She was then bought by a German group who ran her out to South America as a cargo carrying training ship until 1957. She then became a stationary exhibition ship at Travemunde. In 1999 she was refurbished to sailing condition. This was to be Viking’s last voyage and after discharging her grain cargo in London’s Millwall dock she was sold to become a floating hotel and conference centre at Gothenburg, Sweden. Lawhill had been seized in South Africa as a war prize in 1941 as a result of the non-aggression treaty that Finland had signed with Germany and traded between South Africa, and Australia during the war. On her return to South Africa, plans to convert her into a training ship did not eventuate and she was towed up the Tembe River near Lourenco Marques where she was broken up. 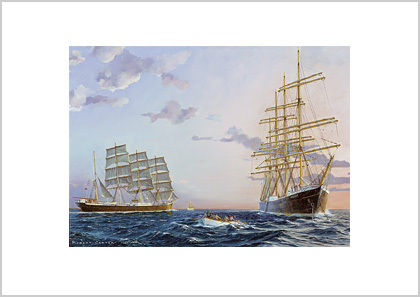 The inspiration for this painting came from the poem Three Tall Ships by Mary Lang. Her beautiful words written in 1936 predicted the inevitable, that lovers of sail knew was not far distant. And back, across the land, a hush came down. And what of joy and grief have they not known? And a glory passing from the world of men. Mary Lang joined the crew on the last of the merchant sailing ships to journey from South Australia to Cornwall in the 1930s. Lithographic print on heavyweight glossy paper. Overall: 50 x 67 (cm) / 19.7 x 26.4 (in) with a white border and caption. 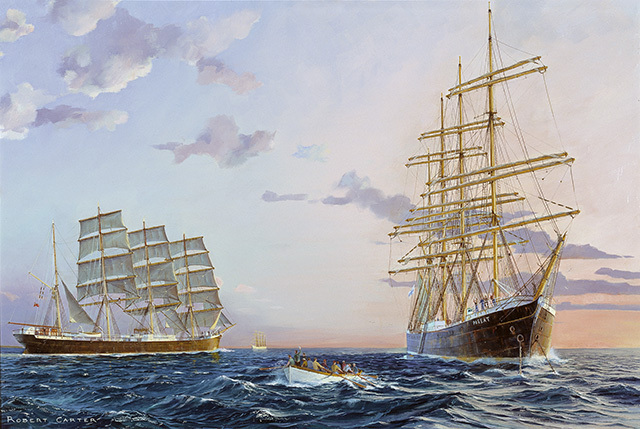 A historic moment in the era of the commercial sailing ship. 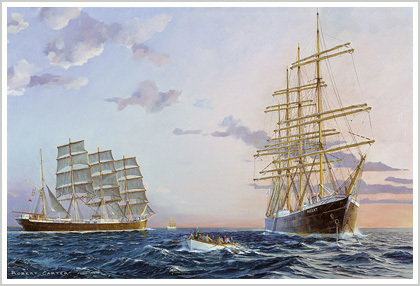 The date is 9 March 1948 and three Finnish 4-masted barques are seen together for the last time.